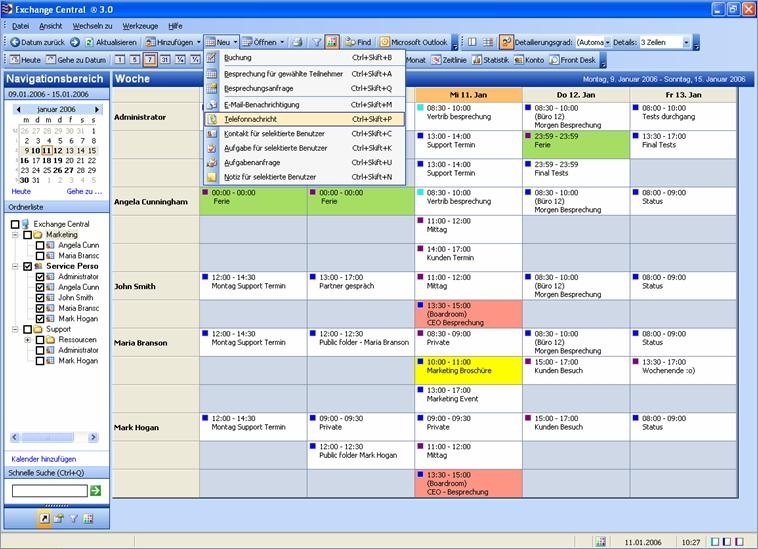 Our client based group calendar, which allows group scheduling of employees, resources and conference rooms. Perfect for the Front-desk clerk, Receptionist or the ”Back-End“ to Plan/Book/Run Statistics of Outlook calendars. Advanced functionality for group/team planning. Planning of employees/meeting rooms/other Outlook resources. The many ”group views” provide you with easy yet advanced access to the individual Outlook calendars. Easy access to advanced planning and booking of appointments and meetings. Create advanced filters based on appointments using the filter guide. Create reports on different statistics based on Outlook calendars, resources or appointments across different Outlook calendars. Create phone messages to individual colleagues or groups. Easy guide to export or share calendar data in all MS Office or HTML formats. Get a complete list of all data (E-Mail address / phone number /Private address etc.) from the Exchange account in a paper form or perhaps as a new ”Desktop Item” on your Active desktop. Get an automatically update for your ”Real-Time” calendar information (not Free/Busy - as in Outlook) – just combine Exchange Central with our server based RealTime Service agent.